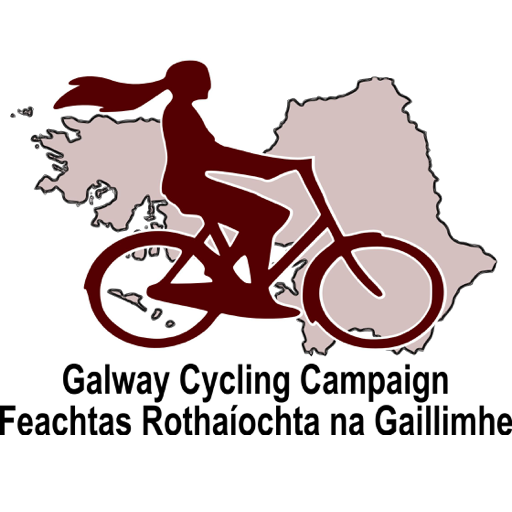 Cycling Campaign makes submission on the Galway City Traffic Management Programme. Calls for vision of Galway as a University City with traffic reduced city centre. The Galway Cycling Campaign has made a submission on on the Galway City Integrated Traffic Management Programme Consultation. The central vision put by the campaign is that Galway should be managed like other well known university cities. 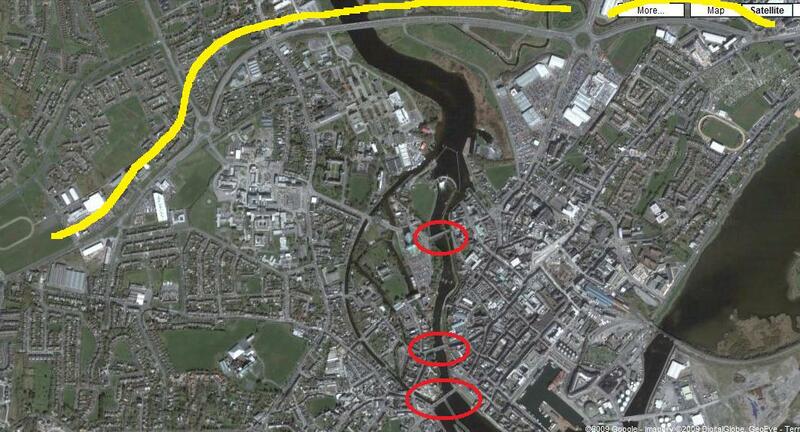 Their submission argues that Galway should see itself as the Oxford or Cambridge of Ireland. Likewise car-focused cities such as Los Angeles or Birmingham are poor models for Galway to follow. The cycle campaign argue for a system of traffic cells modelled on cities like Delft and Groningen with cars banned from crossing the city centre. The Salmon Weir bridge, O’Briens bridge and Wolfe Tone bridge would be closed to private cars but remain open to pedestrians, cyclists and public transport. Private traffic crossing the city would need to use the Quincentenial Bridge. Image: Google Satellite view showing proposed “traffic cells” created by managing access across three city centre bridges. For the wider city, the submission calls for an approach based on a “Hierarchy of Solutions” taken from official guidance. This would require comprehensive measures to address car speeds on city roads with a focus on enforcement. It is stressed that problematic road features need to be removed or modified. Examples include roundabouts in the city which must be either removed or traffic calmed with raised zebra crossings. Substandard lane widths such as at traffic lights are also highlighted. The cycle campaign calls for remedial measures for newer car-based areas of the city such as Knocknacarra. Here the cul-de-sac based housing model needs to be dismantled. In some cases, it may be necessary to purchase properties and demolish them in order to create a functional roads network. Without this, walking, cycling and public transport are discouraged by excessively long travel distances. 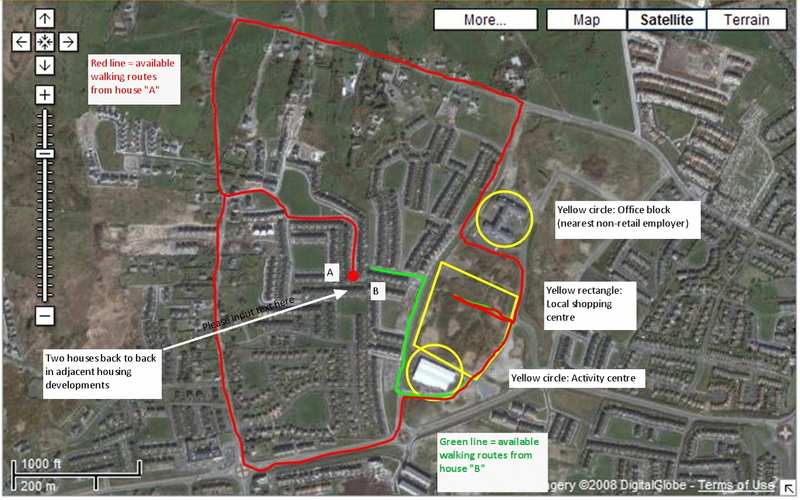 In addition, smaller schoolchildren must have traffic-free routes away from main roads if school-run congestion is to be tackled The consultation exercise is part of the controversial Galway bypass process conducted by Galway City and County councils. 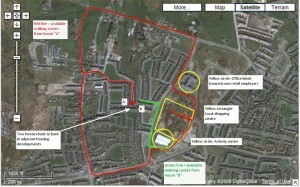 Image: Google Satellite view showing walking distances to local amenities from two adjacent houses. Residents in house A in Cartur Mor must walk over 2km. The same trip for a resident of Cloch Ard is 600-700m.